The feeling is dark and foreboding. The shadows are heavy contributing to the subtle sense that the veiwer is intruding or not particularly welcome here. Almost as if one is standing on the ridge looking down into enemy territory or a place they'd simply rather not be. The feeling of being an outsider is heightened by the earth hanging lonely and distant in the background. As if home and all the feelings that go with it are beyond the viewers reach. The work creates such a sense of isolation that it is undeniably true art. My compliments. I like it with the orange glow better. It makes the station "POP" as they say. Makes it more alive, like it's believably inhabited. Would love to have this one on dual screen! Just gives it a neat perspective! If you have any spare time can you do a dual screen of the original outpost? I like the first version the most. Almost a cartoon style image. Love the site. Been fun watching your artwork evolve over the many years. A bit too dark... Can it be made brighter? Is it possible to change the png image to the orange version as well please? Not sure if I like this version. Some of the orange lighting looks like it is hanging in mid-air. If it is attached to something I don't see it. I can still see windows and lighting below the orange lighting. It's like they are not attached to anything. I'm using the second version for my main background on my desktop. Other than that I like this. The moon surface is fantastic and having the earth in the background is really nice. The changes bring "Outpost" close to perfection! This is an awesome new version, and it makes much more sense to the eyes. Love the crater idea, very cool! This gets a 10, and I'm putting it on my desktop now! Again, well done Ryan! I like the moon surface in the new image, and I love the orange glow. However, I prefer the perspective in the original image. It just seems more lively and interesting somehow. Much better than the first version. The crater gives better perspective as to the size of the station. I don't know, in someone's it looks better without the orange, in other ways it looks better with. Either way works for me. Oh, and in response to Lanithion ("Love it, except..."). If I'm not mistaken, those aren't 'stars through Earth' -- they're lights from the cities on the night side (that is, if we're both looking at the same spot). Your thumbnail at the top of the members page still links to ver. 2 of Outpost, while ver. 3 is in the gallery. I just thought that was a little odd. Although the image is very good either way, I rather like the orange neon - it defines the shape more and draws my eye to things I hadn't noticed before. Much better moon surface then the first image. I do think this is a very dark image, but it is the moon. This is nice addition for the SciFi lovers. I like the one seen from ground level with the orange the best. The ground level ones look more "real" to me, and the orange glow lightens it up and brings out more of the details. I've tried all 3 as wallpaper and that one works best for me. The glow definitely helps the image in my opinion. The details of the radial "Transportation Tubes?" get lost with out the glow. It also adds to the future feeling of the image. It's simple: The deep, dark mood of the new image is perfect. No orange glow needed. Although I thought I would like the orange version better, it was immediately clear to me that this feature is better left out. Although I like it on the spire, having the glow on the tubes is extremely distracting and takes away from the depth perception of the overall background. Anyway, I'm glad you're hard at work again and giving the members what they are asking for. I think that the new outpost image without the orange "neon" glow is much better. Please stick with that one on the gallery! I continue to absolutely love the site, and change my background to your latest one as soon as a new one arrives! I prefer it with the orange glow, it brightens it up ever so slightly and gives it a little more range in color. Okay, I've been looking at this site for the last three years, and love Ryan's art. Absolutely love it. This is one of my favorites he's done, except I have one little tiny nitpick... In the updated version of Outpost, you can see the stars through Earth. I'm an astrophysics major, and little tiny things like that tend to pick at me. But other than that I love it, with or without the orange glow. I prefer the second version (Outpost2). But the third is also good. The orange lights look out place, but I cant say exactly why. Hey, I like this, but with the orange neons, it just defines it a little more. Makes the shape not so dark and a little easier to see. I love the Earth, I think that look really cool. I like it with the orange best.... it's not about realism, it's about the pretty! Suppose that's a good an explanation as any. I think the orange glow added a nice bit of contrast. I also prefered the original image / angle to the two revisions. To me, it seems the brightness of the bottom of the image takes away from the outpost itself, almost "hiding it" to a degree, whereas in the original it clearly stood out (in a good way in my opinion). I like the neon version slightly more... and I'd like a bit more "sun" even more, as I still can't really make out the buildings (and this is on a nice Dell 2405FPW at home now). I prefer it without as well, but thanks for making it and satisfying my curiosity as to what it would look like. Regarding the orange glow, I'm putting in a vote for without - imagination is a good thing IMO. I think I like the versions with orange better. Both the original angle and new angle are nice, but I prefer it with the orange. I prefer it with the glow, myself. I kinda felt that the original version (with the outpost tilted at an angle) seemed more dramatic, but I can understand if it appeared more unrealistic due to scale. I like outpost 3 very much. The orange makes it look a little more alive than version 2. I'm not so crazy about version 1 though, as I agree with the other comments about the size ratio. Sharp contrasts and good proportions makes this one a fine piece of realistic sf-art (again). Though far more realistic, I miss the brighter colours of the original. Somehow I feel the picture is not 'ready' yet; something's missing, but I'm not quit sure what it is. Should the dark shadows surrounding the buildings not be a little bit floodit by those many lights? But maybe the distance to this Outpost is too great to see this. Picture looks actually better full screen than on thumbnail. This one is MUCH better. I hadn't thought it worth while to download the previous version. This one is far superior to the original. I like the position of the base much better now, before it was like the outpost was watching the Earth, but in this perspective it feels like everyone on Earth is watching the outpost, hopeful for it. I still don't think the Earth has enough light on the dark side from cities, unless the landmasses featured are not the Americas in which case I wouldn't know. Other people have mentioned the lights behind the base in the rock, and I too am curious to know what they are. Much better than the first version. 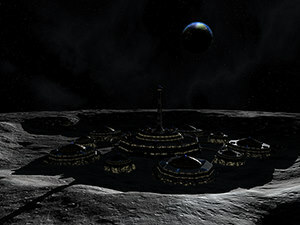 This one really conveys the huge base on the moon. I wonder if those dots on the rock wall behind the base are windows? I was a big fan of the original, but I think this is a great improvement. Much better composition, lighting and mood. Much nicer than the original. 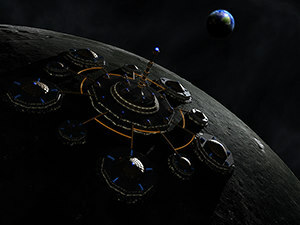 The base on the original was entirely to large, so large in fact that the mass of the structure would have caused significant changes to orbit of the moon. The tiny vehicles on the far right (2560x1600 image) give a nice sense of scale! Thanks for adding the human element! Also, the placement of the Outpost looks like the surface was altered for the construction of the base. Nice touch! I like that you rework some of your images. However, I must say the colors and the ethereal 'hanging' feeling of the planet in the original image was much better. The newer station, while intriguing, lacks the lustrous colors and stark contrasts of the gold against black and the cool blues involved. Keep up the great work. Can't wait to see what you cook up next! I love the colors of the earth - so beautiful! This really fixes the problems with the last one. Including putting much of the ground immediately around the base in shadow, allowing the imagination to expect all kinds of subtle structures, without requiring you to take the months of design time to create them. The lights in the side of the crater wall are also a great touch, that adds to the realism. The lights' shimmering makes the buildings look like carrousels in my eyes. Funny when thinking about the lack of atmosphere on the moon. But it was inspired while sitting with your son - so it makes complete sense. In the first render the station seemed a little bit too big in contrast to the ground. The size in the 2nd render is definitely better - it matches with the surrounding. Can't really make out any details at all on the outpost other than the lights. If this is intentional, well, then I don't like the image. :) Putting the main light a bit more "overhead" would be neat, so you can make out the details of the base a bit better. Beautiful work yet again! The first render was good, but this one really blows it away. The detail on the surface is just incredible (looks like our moon, but could be another little mass floating around in space) and the lighting is superb. I love your work; please keep it up! I like this second render much better than the first one. Great job yet again Ryan! That's a lot better. Still not a favorite though.